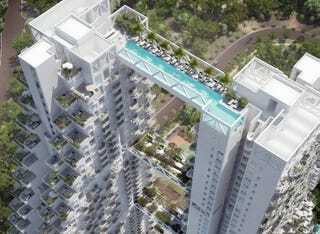 Being a huge fan of pools I can't believe I missed this 50-meter-long swimmable bridge between two condo towers in Singapore. Living at the 574-apartment, 38-story-tall Sky Habitat would be my idea of hell, but I'd love to have a friend there to enjoy that roof and swim through that bridge. The mixed-use building is designed by Israeli-Canadian architect Moshe Safdie and will be completed in 2015. The building also has a huge pool at ground level and two more garden bridges.